Bahrain Institute of Banking & Finance (BIBF) was announced the second place winner of the 2018-2019 CFA Institute Research Challenge in Bahrain, in a close competition hosted by CFA Society Bahrain, the Kingdom’s pre-eminent association for local investment professionals. The competing teams produced an equity research report on the financial performance of Bahrain Telecommunication Company (Batelco), which was then judged by CFA Society Bahrain and representatives from SICO and Bank of Bahrain & Kuwait (BBK) based on accuracy, insight and analysis. 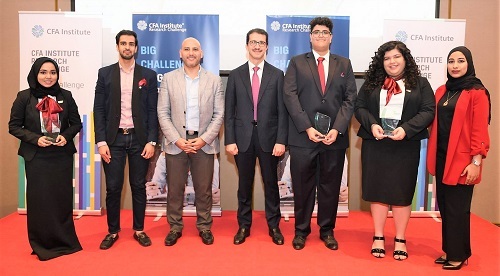 This year’s competition featured four universities including: University of Bahrain, Bahrain Polytechnic, Bahrain Institute of Banking and Finance (BIBF) and Strathclyde Business School. BIBF team (Noor Esbai, Feras Al Banna, Jannat Al Firdous) will compete in the MENA competition in Jordan on March 29 – 30 under the mentorship of Latifa K. Mohammed, CFA, Industry Mentor and Yousif Musayeb, CFA, Faculty Advisor.